Ace Frehley's The Spaceman is ready to rock! Glam-rock band KISS collides with Sanrio's Hello Kitty. 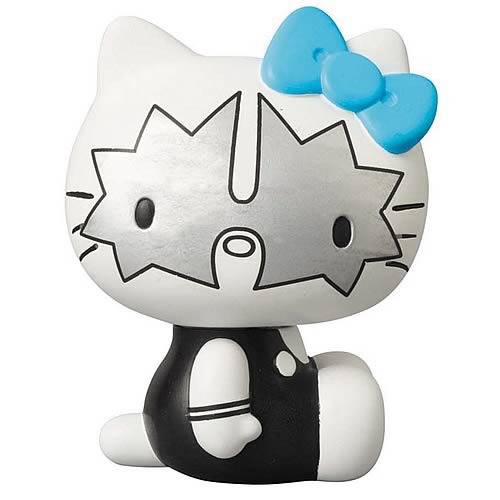 This Hello Kitty KISS vinyl figure is ready for your collection! Rock in the cuteness! The iconic glam-rock band KISS collides with the world of Sanrio for Medicom's line of KISS x Hello Kitty Vinyl Collector Dolls. The Hello Kitty KISS The Spaceman Vinyl Collector Figure measures 4-inches tall and features Ace Frehley's The Spaceman, made up to look like the adorable Hello Kitty. Are you ready to rock? This 4-inch tall Hello Kitty KISS figure is ready for your collection! Ages 15 and up. Meow.